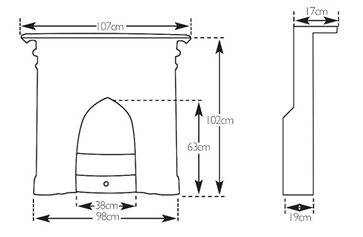 This fireplace is NOT compatible with the gas insert so the only option available is insert only or with an Ashpan. 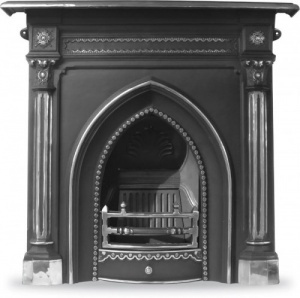 The Gothic cast iron fireplace in the Revival style is both elegant and simplistic, with a gothic archway. Finished in a highlight finish. Suitable for solid fuel or gas. For solid fuel use you will need an ashpan. Also available with a Nu-Flame gas insert, which creates a coal effect fire with coals and real flames. To add to order select from options on right hand side. Part of Carron fireplaces range.